You could easily make your entire trip to Greece into a tour of the beaches of Santorini. For being a small island, there are quite a large number of options, and each beach offers a unique experience. Some are famous for their colored pebbles and others for their wild cliff backdrops. 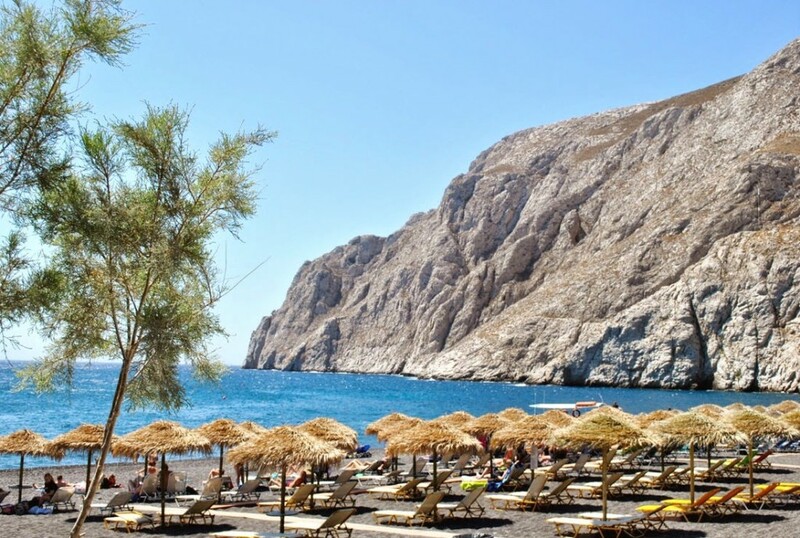 When I visited a few years ago my immediate question was how to get to the beaches – they are spread out around the island away from the popular towns Fira and Oia – so I decided to put together a guide of the best beaches in Santorini and how to get there. The Red Beach was the first beach I heard about before my trip, famed for its red and black pebbled “sand” and the red rock formations creating a dramatic backdrop. It is located near the excavations of Akrotiri on the southern side of the island and is fairly difficult to get to compared to some of the other beaches. This means fewer crowds though, and the stunning view is worth the effort. There are plenty of spots along the beach to grab a bite to eat during high season. According to the Greek Tourism website, “access involves a walk from the harbour of Akrotíri (around 10 minutes) or by boat from Kamári, Akrotíri and Períssa.” The harbour is beautiful and would be a lovely place to dock a boat, although I’d certainly make sure you have some wet steps at hand. The walk includes descending down an area of rock at one point so where decent shoes if you take this route. You probably won’t be staying nearby but you can rent a four wheeler or motorbike to make a fun day trip out of it. Your hotel reception or rental manager should also be able to guide you there with public transportation or a tour boat. The bus ride from Fira to Akrotíri takes about 30 minutes according to this site. Next to the Red Beach is the famous White Beach, not because the sand is white (it’s actually black) but because it is surrounded by stark white cliffs. This secluded cove offers a quiet place to enjoy the beach. The only facilities offered on the White Beach are a few umbrellas and sunbeds. The White Beach is only accessible by boat (unless you are a professional rock climber – not me), so if you decide to take a boat from Akrotíri to the Red Beach, try to select one that continues to the White Beach as well. You may have to swim to shore from the boat so dress and pack accordingly! Make sure you’re a confident swimmer beforehand too! If you aren’t so confident, there is no shame in receiving lessons. Somewhere like private swimming Coast2Coast could be helpful. 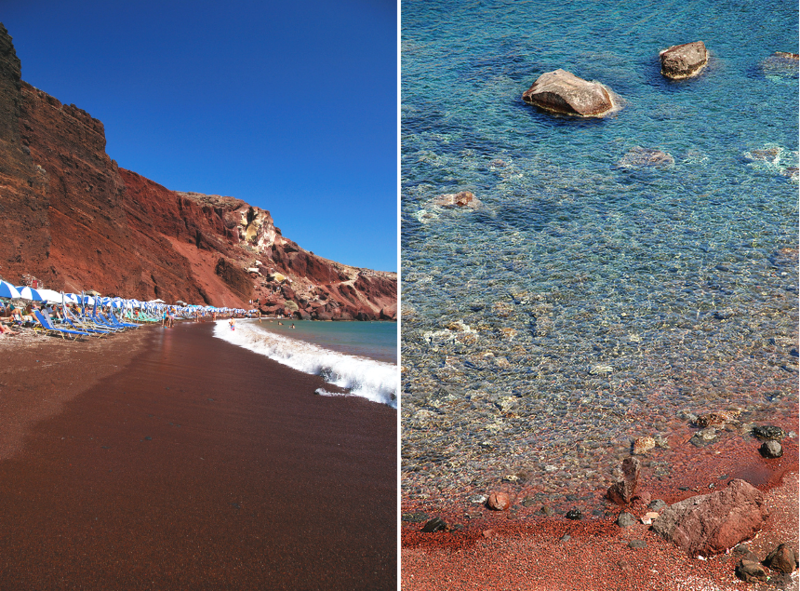 Between the Red Beach and White Beach is Kampia, a quiet beach that you can reach by path from the Red Beach. If you can’t make it all the way to the White Beach, wander over and find Kampia. 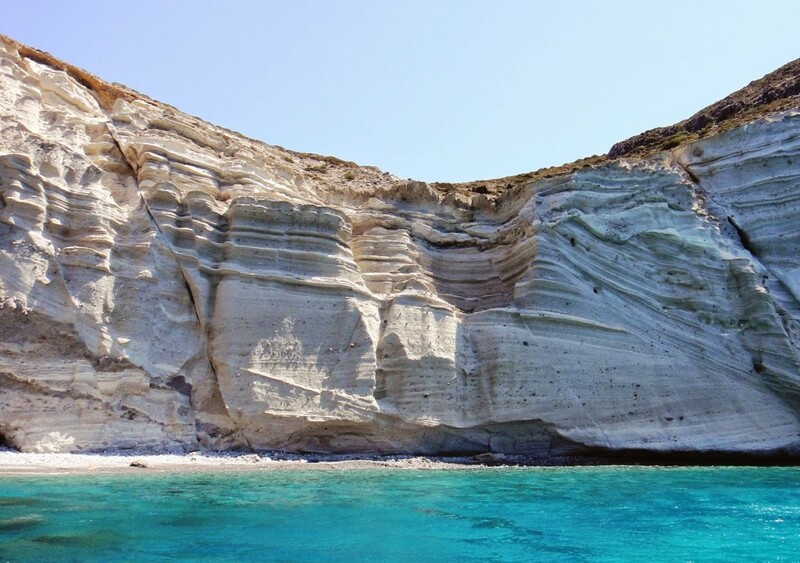 Vlichada is a grey sand beach in the south of Santorini with huge rock formations creating a surreal backdrop that some say resembles the moon. This beach hosts a sailing and yacht club but is otherwise peaceful and quiet, perfect for those looking to enjoy the sand and the sun. 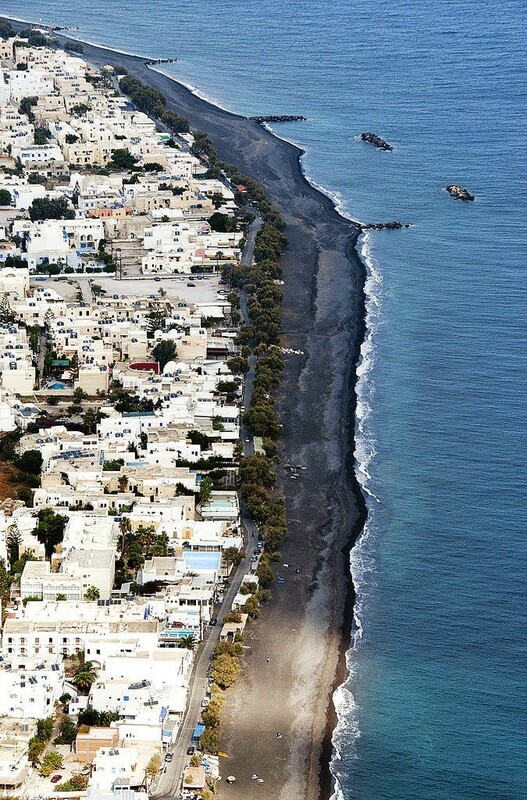 These three beaches run one after another on the southeastern side of the island forming Santorini’s longest stretch of black sand beaches. This is the place to go if you want to find a diving or water sports center, rent jet skis, parasail, wind surf or kayak. A friend of mine visited these beaches, as she is a keen surfer. She recommended that if I ever decide to go here, I should pack clothes that are comfortable and come prepared with a camera to capture the moments. She then mentioned how I should buy animal hoodies online from Ann’s Cottage, as this is said to be popular amongst the surfing community. I’ll take her word for it, if I ever decided to take a trip to Santorini. For those looking for less adventure, there are plenty of beach bars to hang out at all day long. 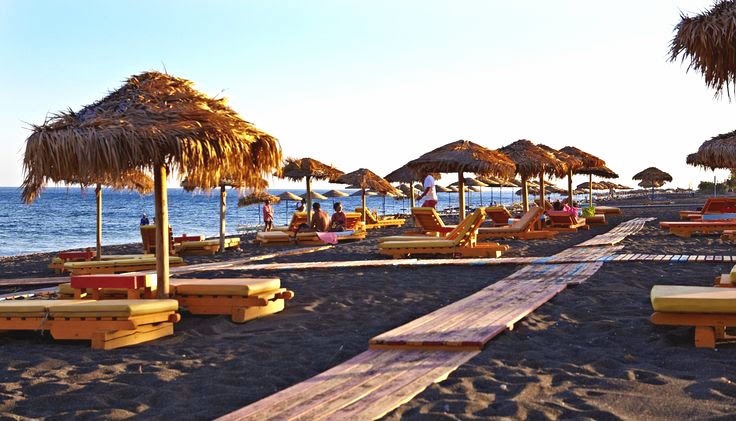 Since the black sand can get hot, order from a restaurant along the beach and use their complimentary chairs. There are a number of resorts lining the beach so if a beach vacation is what you are looking for you can stay right here. The easiest way to get around the island is to rent a four wheeler and roam at your own pace. There are also buses running between Fira and Perissa that take about 20 minutes. 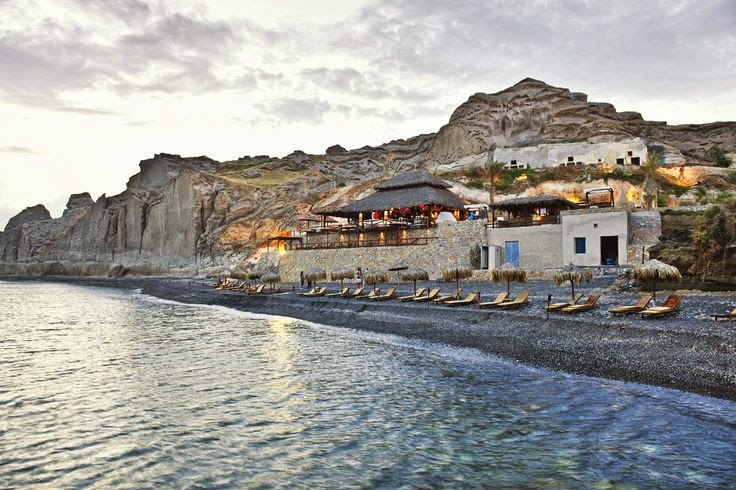 Kamari is located on the southeastern side of Santorini just above Perissa and Mesa Vuono, the rocky mountain separating the two beaches. Kamari offers a lively waterfront with diving centers and access to water sports. There are plenty of amenities at this beach and it can get pretty crowded during high season. The village nearby hosts a variety of hotels, restaurants and bars and you can take a road up the mountain to see Ancient Thira. Since Kamari is a tourist haven there are resorts right there. If you are staying elsewhere, rent a vehicle or take the short bus ride from Fira. This is probably the most accessible beach on the island. The fun doesn’t have to stop there though. There are other beaches hidden around the island like the quiet beaches dotting the eastern side of the island, the windy and secluded beaches hidden from view on the north side of the island, Caldera offering unbeatable views of the volcano and deep, clear waters or Gialos, a beach for adventures who are looking for an off-road adventure to get there. Wondering how much a trip to Greece might cost you? Nomadic Matt has a great overview of the cost of traveling around Greece. And here are some other resources for planning your trip to Santorini based on some FAQ’s I get. What a beautiful place to be! It looks like a piece of heaven. Such lovely pictures! I’ve always wanted to visit Santorini! The pictures of the beaches are absolutely gorgeous! I’ve been wanting to go to Greece for a long time, I just wasn’t sure if the atmosphere would be good since they have been having such bad economic troubles. In Greece.. and Jordan, Israel and Egypt.. I found that many locals want tourism to help boost the economy. They were very welcoming and wanted us to tell our friends and family to come back. We did see a strike in Athens but it was minimal. Wow looks so awesome thank you. You’re welcome. Thanks for reading Joseph! I love your post and images!! I’ve never been to Santorini but it is on my bucketlist. Thanks Julianna! It’s a fabulous destination! This is beyond beautiful and a place I would LOVE to go! !